Haitian soldiers Rodini Pierre-Louis, Dave Basquin et Livens Dervil were the authors of a fight at a night club and they opened fire injuring at least two people. They fled the scene of the incident and were later arrested by police. The Haitian ministry of defense said Tuesday the soldiers did not have any authorization to in that part of the country and the proper authorities have been instructed to take the necessary measures. 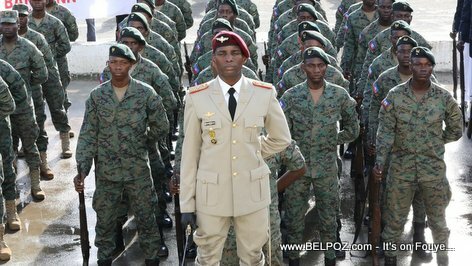 Question: Does the new Haitian army have any military police? Who are these "proper authorities" instructed to take action when a Haitian soldier misbehaves? Did you hear about the Black guy that got arrested in China for fighting in a club? they shuld be fired immediately cause their their stupid. Pa vin konplike anyen la. Menm instans ki la ki pou pini polisye a ka pini soldat a tou. Mwen pa vle okenn moun vin mete polisye yo en face soldat yo. Wi an ka de flagans la polis ka aretel. QUESTION: Eske yon policier (PHN) gen dwa arete/fouke yon Soldat militè (FAD'H)?